In a small bowl, combine the sour cream, cumin, and ¼ teaspoon of the salt. Cover and refrigerate. Heat the oil in a large saucepan over medium-high heat. Add the garlic and cook for 1 minute. Add the tomatoes and their juices, the pepper, and the remaining salt and bring to a simmer. Cook for 10 minutes. Add the jalapeños or hot sauce and hominy and simmer for 5 minutes. Add the shrimp and simmer until pink and cooked through, 3 to 4 minutes. 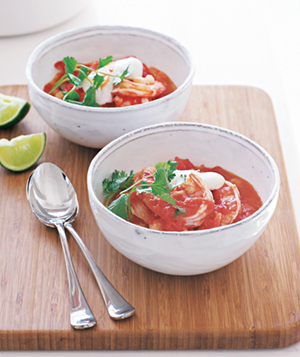 Ladle the soup into bowls, top with a spoonful of the cumin cream, and sprinkle with the cilantro (if desired). Serve the lime on the side. This sounds really good. I want to try this and add avocado, olives and maybe some cheese. Btw I’ve been wondering have you totally stopped eating desserts? I know I have only scratched the surface of your blog so you may have mentioned this before. I just want to know what you think of things like black bean brownies. I definitely do enjoy desserts, but its a rarity. It might be like a couple of cookies every month or so. This sounds great! I have most of the ingredients on hand and will be trying this soon.